The small town of Macedonia, West Virginia in the year 1938 is full of quirky characters doing their best (or worst) to get through the Great Depression. The most beguiling is twelve year old Willa Romeyn who lives with her beloved Aunt Jottie and various odd relatives. Willa spends that sweltering summer trying to uncover the town's secrets while listening to gossip from her porch sitting, iced tea drinking kin and neighbors. Into this mix comes Layla Beck who has been sent to do a history of Macedonia by the WPA works. She finds lodging with the Romeyn family which makes everyone uncomfortable, especially when Layla finds there is more fiction to the history than fact and a long ago mystery comes to light. There are some lessons here about speaking the truth and keeping one's own council. Barrows evokes the charm and eccentricities of a small town very well. From the co-author of The Guernsey Literary and Potato Peel Pie Society comes a wise, witty, and exuberant novel, perfect for fans of Lee Smith, that illuminates the power of loyalty and forgiveness, memory and truth, and the courage it takes to do what's right. Annie Barrows once again evokes the charm and eccentricity of a small town filled with extraordinary characters. Her new novel, The Truth According to Us, brings to life an inquisitive young girl, her beloved aunt, and the alluring visitor who changes the course of their destiny forever. In the summer of 1938, Layla Beck's father, a United States senator, cuts off her allowance and demands that she find employment on the Federal Writers' Project, a New Deal jobs program. Within days, Layla finds herself far from her accustomed social whirl, assigned to cover the history of the remote mill town of Macedonia, West Virginia, and destined, in her opinion, to go completely mad with boredom. But once she secures a room in the home of the unconventional Romeyn family, she is drawn into their complex world and soon discovers that the truth of the town is entangled in the thorny past of the Romeyn dynasty. At the Romeyn house, twelve-year-old Willa is desperate to learn everything in her quest to acquire her favorite virtues of ferocity and devotion--a search that leads her into a thicket of mysteries, including the questionable business that occupies her charismatic father and the reason her adored aunt Jottie remains unmarried. Layla's arrival strikes a match to the family veneer, bringing to light buried secrets that will tell a new tale about the Romeyns. As Willa peels back the layers of her family's past, and Layla delves deeper into town legend, everyone involved is transformed--and their personal histories completely rewritten. Read by Ann Marie Lee, Tara Sands, and Julia Whelan, with additional readings by Cassandra Campbell, Danny Campbell, Mark Deakins, Kimberly Farr, Kirby Heyborne, Lincoln Hoppe, Paul Michael, Linda Montana, and Arthur Morey. 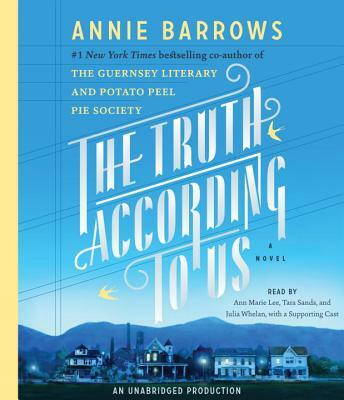 Annie Barrows is the co-author, with her aunt Mary Ann Shaffer, of The Guernsey Literary and Potato Peel Pie Society, a runaway New York Times bestseller that was named one of the ten best books of the year by Time and USA Today. She is also the author of the children's series Ivy and Bean as well as The Magic Half and its sequel, Magic in the Mix. She lives in Berkeley, California.